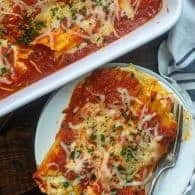 This cheese manicotti is a family favorite in my house! I add spinach to make this dish a bit healthier and my kids don’t even realize it’s in there! I love pasta. It’s one of those meals that will please just about anyone and it’s usually easy to throw together! 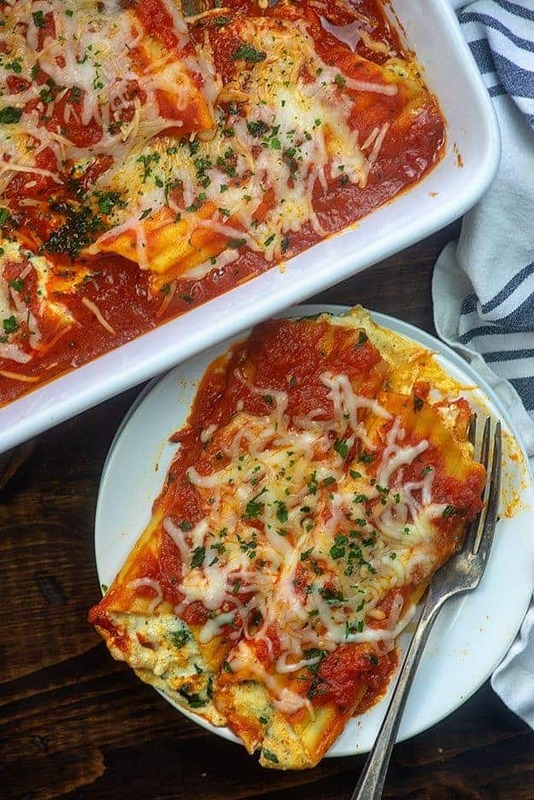 One of my absolute favorites is manicotti. 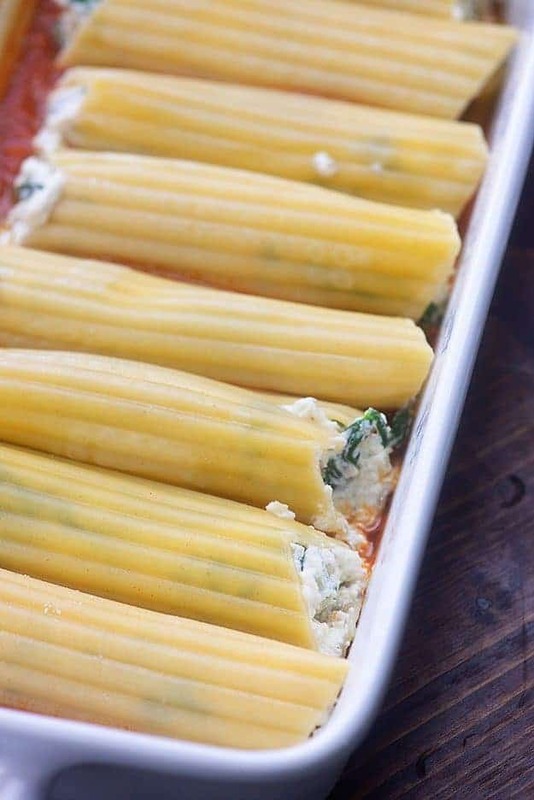 Manicotti are just big empty pasta tubes that you fill up with good stuff. Imagine the possibilities! I can think of a hundred delicious things to stuff inside of pasta! Today we’re doing a four cheese manicotti and adding in some sauteed spinach. It adds a gorgeous color to the filling and tastes amazing here. You’ll start by boiling your manicotti. Once cooked, drain the pasta water and let the manicotti cool a bit. You’ll be handling them and you don’t want to burn yourself. While the manicotti cools a bit, prepare the filling. Mix together your four cheeses and seasoning. 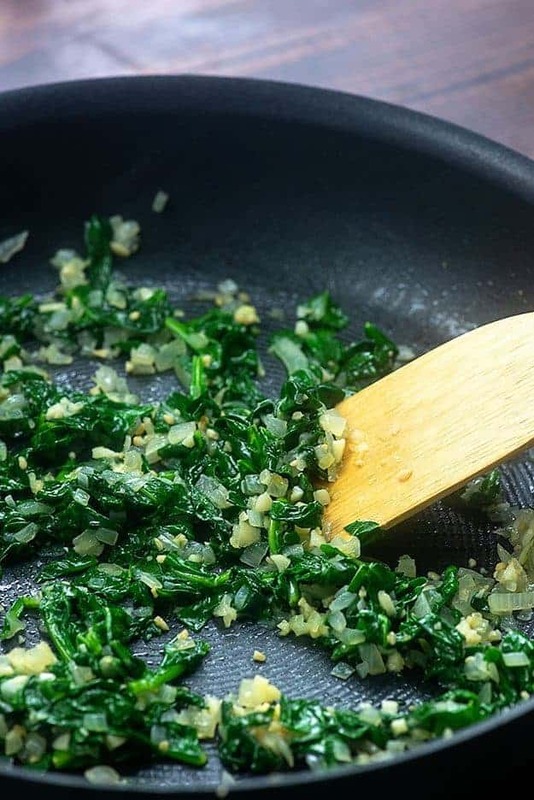 Saute the spinach in a little oil with some garlic and onion until the spinach is wilted. Stir the spinach into the cheese and start stuffing your pasta. You can use a spoon to scoop it into the tubes, but I find it easiest to add the filling to a plastic bag, snip off the end and squirt it in. 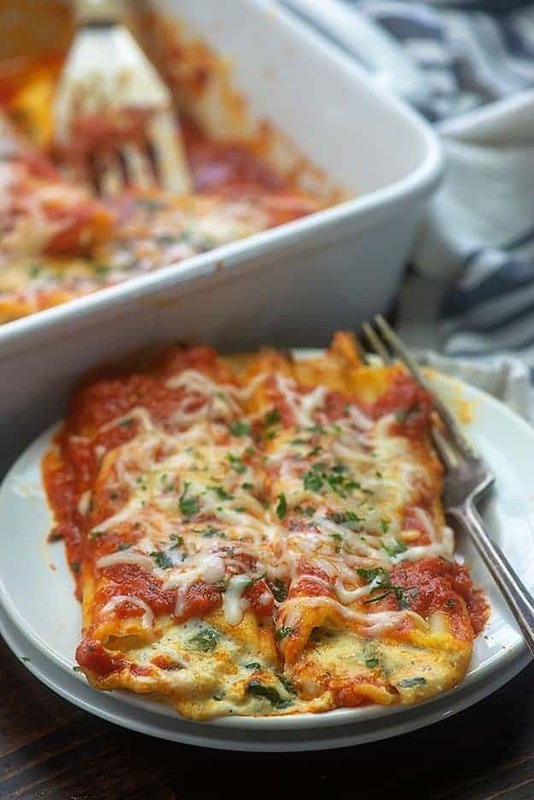 Layer the filled manicotti over some marinara sauce. 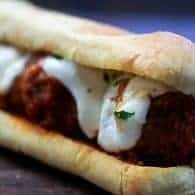 You can use my recipe below for homemade marinara or you can purchase a jar. If using store bought, I always recommend Rao’s brand. It’s my favorite marinara, but it is a bit pricey. You’ll top this off with more marinara and extra cheese. This makes a great vegetarian meal, but if you want to bulk it up with some meat, use my homemade spaghetti sauce instead of the marinara. 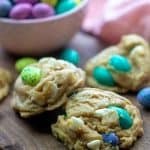 This whole recipe is really quite easy to throw together and it has such a pretty presentation. Who doesn’t love carbs stuffed with cheese?! Chicken Spaghetti Recipe: This one is a favorite with my kids! Shrimp Alfredo: Tastes like a fancy dish you’d get from your favorite Italian restaurant! 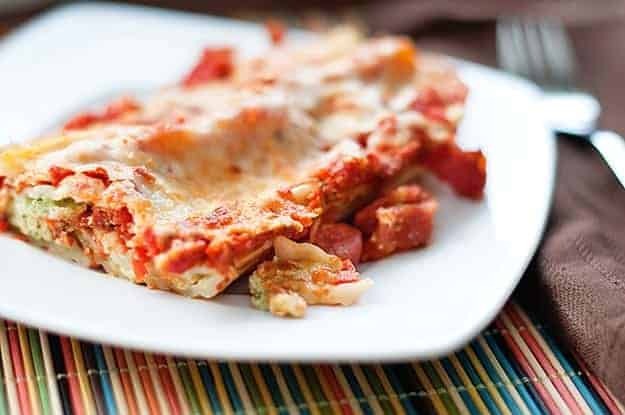 Baked Ziti Recipe: The creamy white sauce takes this dish over the top! Hamburger Helper: Skip the box – my homemade version is better! Garlic Butter Noodles: Simple comfort food! Extra cheesy pasta is always a win in our house! Bring a large pot of salted water to a boil. Add in the manicotti and cook for 7 minutes. Drain. Set aside the pasta to cool and begin making the filling. 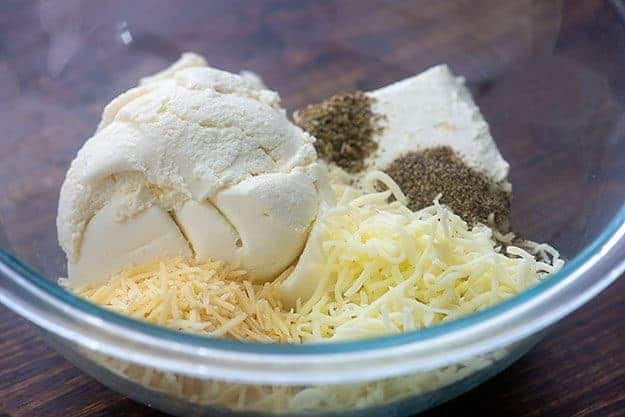 In a large bowl, mix together the Ricotta cheese, 3 ounces of Mozzarella, 3 ounces of Parmesan, cream cheese, Italian seasoning, and basil. Heat the olive oil in a small skillet over medium heat. Add the spinach, onion, and garlic and cook until the onion is translucent and the spinach has wilted, about 5 minutes. Add the spinach to the cheese mixture and stir well to combine. When the pasta is cool enough to handle, use a small spoon to scoop the filling into the pasta. Alternately, place the filling in a plastic bag and snip off the end. Squirt the filling into the manicotti. Cover the bottom of a 9x13 baking dish with a thin layer of marinara sauce. Arrange your pasta in the baking dish. Cover with the remaining marinara sauce and top with the remaining cheese. Bake in a preheated 350 degree oven for about 20 minutes or until the cheese is melted and starting to browned on top. Sprinkle with parsley before serving. Heat the oil in a large sauce pan over medium heat. Add the onion and garlic and saute until soft and fragrant, about 5 minutes. Add the remaining ingredients, stir to combine, and simmer for 30 minutes over low heat, stirring occasionally. Store sauce tightly covered in the refrigerator for up to 5 days. Use store bought marinara, if preferred. This post was originally published in 2011. It’s been updated with new photos and text in 2019. Original photo below. Mmm, I love italian dishes! And the spinach wouldn’t bug me one bit! Karly…this could be one of your finest moments! It looks like it has “Gina” written all over it. I will be stuffing shells..and my mouth..this weekend. 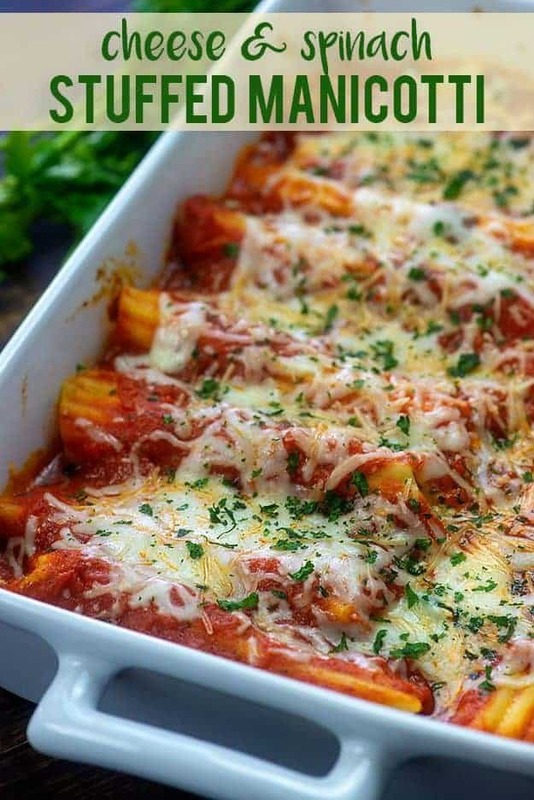 I’m so hungry right now, but this manicotti would look delicious even if I was full! I’m okay with anything that involves mixing four cheeses together than eating them. And the lovely carbaliciousness of this is just an added bonus. You read my mind! 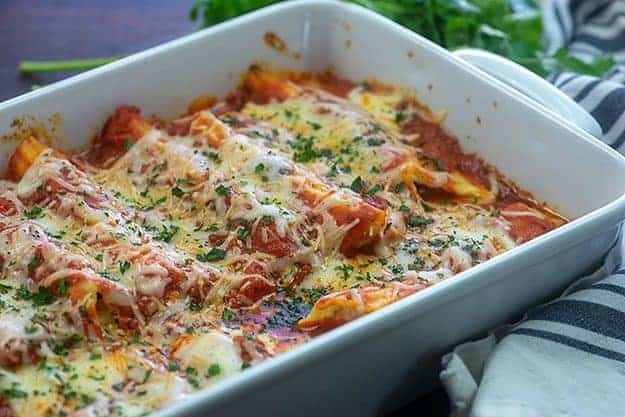 I just made some stuffed cannelloni last night because I was having a major craving for a stuffed pasta bake. 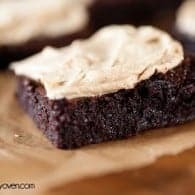 This is going next on my list for when the next craving hits! Looks sooo delicious. The pasta looks yummy. Is there any european alternative for the monterey jack? Don’t know where to get that cheese in Germany. Wow, this looks amazing. Your pictures are wonderful! Happy Tuesday! This is definitely a comfort meal in my book. Delicious. WELL!!!! Since I also love pasta and have spinach growing in the garden I cannot think of any reason NOT to make this. Except … Shoot, there is not except!!!! Why have I never made these? Holy yum they look good! Cheese and spinach in pasta- yes please! I haven’t made these forever ~ thanks for the reminder. I’m on a spinach kick lately, so love the spinach addition. I’m even drinking daily spinach and banana smoothies – yum!! Umm… yes please! This sounds like a perfect dinner to try this week! Such an amazing dish! I was craving a heavy dish for tonight and this turned out divine! I used fresh baby spinach we had cooked down earlier in the week and had leftovers of. We substituted mascarpone for ricotta since we have some picky eaters. Still turned out lovely! Great recipe! The recipe looks wonderful. I gave you only four stars because my husband is gluten intolerant, basically, he has celiac. This is a relatively “new” condition, the last ten years, caused by the newer hybrid wheat. Do you know where I can obtain a gluten-free manicotti? I see G.F. spaghetti, penne, rotini, and fettuccini. No, I’m sorry, I don’t have much experience with gluten free products. 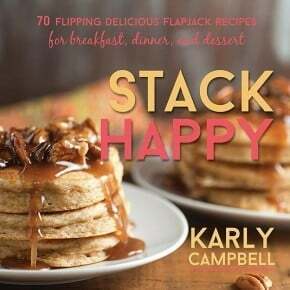 Love many of your recipes, have tried them and they are super. However, please check out folks who have Celiac Disease. It can be present at birth or acquired as an adult, due, as I mentioned, to the hybrid wheat that withstands both drought and torrential rain. This is great for our farmers who do need all the help that they can get, but it is bad for those, like my husband, who cannot tolerate Gluten, the protein in wheat, barley, and some oats. Thanks in advance for you going to the trouble of checking this out. I will be making this this week. A sincere thank you for sharing so many wonderful family recipes. I look forward to receiving your emails. I love this dish. It looks like you have really done something when you serve it. I haven’t fixed any variety of this in a long time. I pinned it because it took be a great take and bake dish. Can your Basic Marinara Sauce be frozen. 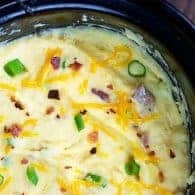 I usually have some leftover after using what is called for in a recipe?